The Moon is the Earth’s nearest neighbour in space, and it can be the brightest thing in the night sky. It’s also one of the most amazing sights seen through even a small telescope. If you look at only one thing through a telescope, it should be the Moon. But you need to observe it in just the right conditions. The Moon at its brightest (during a full Moon) can actually be a hindrance to astronomy, because it drowns out the light of the fainter stars; it’s like natural light pollution. The Moon goes through its cycle of phases once every 29.5 days. During a new Moon, when the Moon lies in the same direction as the Sun when seen from Earth, the Moon isn’t visible in the skies at all. A few days after the new Moon, the Moon will start to appear as a thin crescent before growing to a half Moon and then a full Moon. The Moon then appears to shrink again on its way back to the new Moon. The figure shows what the Moon looks like during each phase. For you stargazers intent on chasing down the faintest stars or the faint fuzzies, anything brighter than a crescent Moon can hamper your chances, so you’ll need to time your observation with a new Moon or, at the very most, a thin crescent Moon. The Moon itself makes an amazing target for stargazers, especially when it’s a thin crescent Moon. Aristarchus crater is the brightest crater, visible to the naked eye in the upper left portion of the Moon when seen from the northern hemisphere. Copernicus crater is a large bright crater with prominent bright rays, situated left of centre of the Moon when seen from the northern hemisphere. Kepler crater is another large bright crater, located left of Copernicus when seen from the northern hemisphere. Tycho crater is a large crater surrounded by numerous smaller craters, in the lower left portion of the Moon when seen from the northern hemisphere. Mare Crisium, the Sea of Crises, is a large, flat, dark plain in the upper right portion of the Moon when seen from the northern hemisphere. 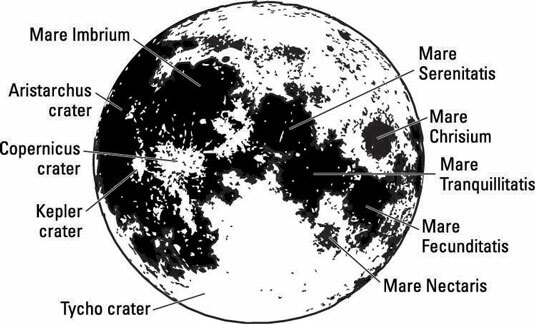 Although the Moon is covered in patches called mare, Latin for sea, there’s no water there; the name mare comes from the days when people thought there might be oceans on the Moon. Now we know better; it’s a dry lump of rock, and the mare are simply flat plains of dark rock. Mare Fecunditatis, the Sea of Fecundity, is located just below and to the right of the famous Sea of Tranquillity (see below) when seen from the northern hemisphere. Mare Imbrium, the Sea of Rains, is the largest of the Moon’s ‘seas’, located just above Copernicus crater when seen from the northern hemisphere. Mare Nectaris, the Sea of Nectar, lies just below the famous Sea of Tranquillity when seen from the northern hemisphere. Mare Serenitatis, the Sea of Serenity, lies just above the Sea of Tranquillity when seen from the northern hemisphere. Mare Tranquillitatis, the Sea of Tranquillity, is perhaps the most famous feature on the Moon, because it was the landing site for Apollo 11, when Neil Armstrong and Buzz Aldrin became the first men to set foot on the Moon’s surface. 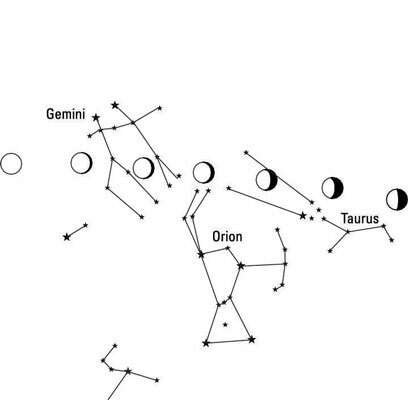 The figure shows how the Moon appears if you’re stargazing in the northern hemisphere; southern hemisphere stargazers will see it upside down. Stargazing: Half the Moon is always lit! The Moon is a sphere of rock, and as the Sun shines light out into the solar system, half of the Moon’s surface is always lit. It doesn’t matter that you can’t always see the entire lit half; the Moon is always half lit by the Sun. As the Moon orbits the Earth, sometimes that lit half is pointing right at you, so you see all of it (a full Moon), but sometimes the Moon’s at such an angle that you see only part of the lit half. Maybe you see half of the lit half (a half Moon) or sometimes just a sliver of it (a crescent Moon), but half the Moon is always lit.